Equipping the aging Pentium MMX with the 100MHz Front Side Bus setting present on Super7 motherboards breathes new life into the processor platform. 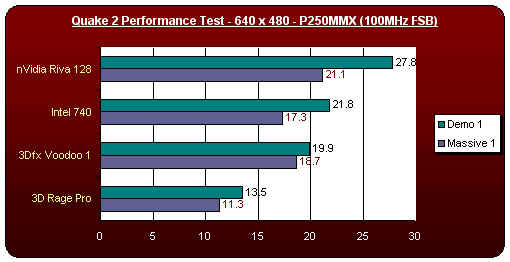 The results are quite nice, and are even giving the 300MHz K6-2 a run for the money. Intel's own i740 once again takes a backseat to the nVidia Riva 128 by a noticeable difference of around 5 fps in normal gameplay. 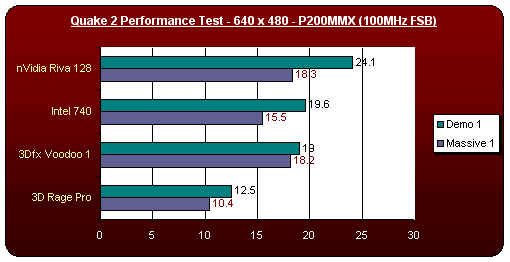 The i740 seems to be a weaker multiplayer chipset since its 'Massive 1' (Multiplayer Netplay Demo) scores are well below those of the Riva 128 and the Voodoo 1. If you are a Netplay advocate, then you may want to leave the i740 out of your possible choices. 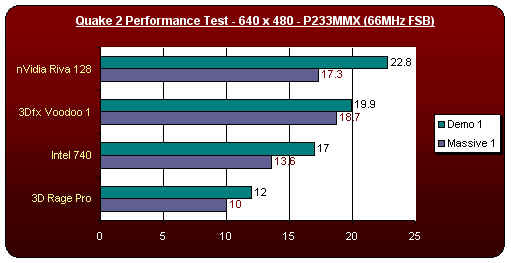 Once again, the 66MHz FSB takes the Voodoo 1 up to 2nd place and leaves the i740 as close to the 3D Rage Pro as possible. For your Pentium MMX 233, the choice is clear, the Riva 128 has what it takes to be a wonderful Super7 companion. The 250MHz setting seems to be the Super7 "sweet-spot" as it provides frame rates closer to a smooth 30 fps than even the K6-2 running at 300MHz. 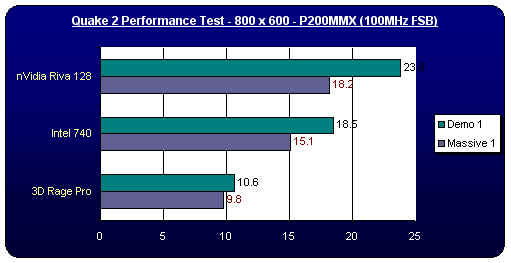 This is courtesy of the strong FPU of the Pentium MMX, however as far as the rankings go, there is no real change. The first place position still belongs to the Riva 128.